WELCOME! 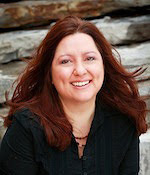 First, mark your calendars for November 7th, 2012, for an Author Chat Party on Facebook!! Click below on the green words below the photo to ENTER for your chance to WIN an Amish Kindle Gift Pack Giveaway (contents listed below)! 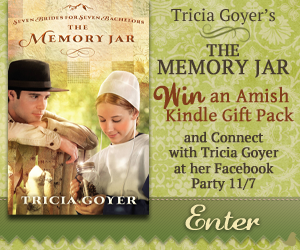 THE MEMORY JAR BY TRICIA GOYER | AMISH KINDLE GIFT PACK GIVEAWAY AND FACEBOOK PARTY! An amazing, heart-warming, soul touching story of friendship, loss, blame, love, family, misunderstanding, finding our true path in life and following God's plan for it and living it. Meet our main character, Sarah Shelter, who has suffered so much in her young twenty-two years of life. Sarah has a very close sisterly friendship with Patty, with whom she grows up with and seems so much wiser than her age in years. Sarah suffers the loss of her whom she blames no one but herself for. Sarah cannot overcome the guilt over Patty's death which keeps her stuck in life, almost paralyzed from moving on because of the heavy blame she puts upon herself over and over again for Patty's death. She suffers from extreme feelings of guilt, grief, and 'if only's', to the point of struggling to try to know who she is and what she wants as a person and is left stuck, feeling almost frozen in life without Patty. As Sarah goes along in life, she clings to her memories in what she calls her 'Memory Jars". These hold little trinkets of things she has collected with Patty, and on her own. These little trinkets in these jars mean everything to her. She keeps these near and dear to her heart. She does have one great talent that she loves to do, and it is not her ability to cook, but to bake cake and cupcakes. Can she reach her dreams by putting these memories into her heart instead of stuck in her head going over them over and over, and start living her life? Introducing Jathan Schrock, a young man from Ohio who came to West Kootenai, Montana, 'with the promise of high mountains, endless forests, and abundant game calling to the outdoorsman' (from the book), who is not quite so happy with what is expected of him when he returns back home for his future. In a way he is running away from things at home, but being here now he hopes will help him make some decisions for his return home and his future job to make a living by bringing a couple of special books with him he hopes to learn from. He feels a heavy burden upon his shoulders of having to live up to what his older brothers have achieved, and to be able to make his father proud of him, but at his expense of his personal happiness. Now, here in Montana, where 30 or more young bachelors come each Spring to live for 180 days before they can be considered residents in order to be able to go hunt large game in the Fall, he did not come with the intentions of finding a possible future wife like many of the young men do, but to sort out his life to be able to live his hopes and dreams, and approach his family with what he wants to do, and not what is expected of him. Jathan goes on a hike up a large mountain with a group of people, one of them being Sarah. They meet, and sparks fly. Now he does have his eye on this beautiful young woman, and she, him. They both learn a lot about each other as time goes on and they start to develop serious feelings for one another, that is until Jathan must return home due to a possible tragic outcome. Meanwhile, Jathan is really struggling with what he wants to do, which is to live his hopes and dreams versus what his family expects him to do. Sarah's heart is broken when Jathan leaves. She feels as if she has yet run off another person out of her life again. As you read this story, you will feel for both of these characters equally, as if they are your friends/family. These two will truly steal your heart away in this story. They sure did mine. 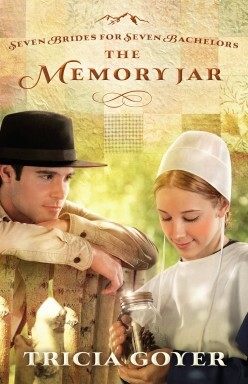 Author Tricia Goyer never disappoints me with her books about the Amish. Her books are some of my favorites. She can tell an Amish story that is SO intriguing about the 'plain people' and turn them and their lives into colorful stories we never could have imagined, thus making their stories she writes some of the most colorful people I have ever read about! The issues she brings to light are some of the same types of things that happen to us in our own lives, not just the Amish. We all go through very similar things in life. Our ways may differ vastly in many ways from each other's ways of living, but when we get right down to it, we all face the same issues and emotions in our our hopes, dreams, and wishes that we all have. These things may change as we live our paths of life as we have chosen them, yet we learn from life experience as it happens, and this is what Tricia brings to us in this book. I loved the reference she made in this book to a character in one of her previous books! That was great! I am always eagerly waiting for her next books, always, and this one may be the best yet! The Memory Jar - what an interesting concept! Who would have thought about this? I never would have thought of collecting memories and storing them in a jar, or for that matter, several jars like Sarah and Patty have! This is part of what makes this book so special. Release Date: 10-23-12 - Available for Pre-Order! Order yours today and it will be shipped or downloaded onto your Kindle on the that day! This has been a LitFuse Group Book Launch/Blog Tour!